Second-hand stores, vintage shops, thrift stores in Amsterdam – whatever you call them, they all have one thing in common: a wide-ranging selection at unbeatable prices. If you care about the planet, care about your bank account, and you’re in the Amsterdam area, you must take a look at all of these options – perfect for living zero waste in Amsterdam. In the city alone, there are 35 amazing second-hand stores (and 57 in total that I’ve found)! If you’ve ever wondered where to shop in Amsterdam for amazing deals, are looking for more unique additions to your personal style or home decor, or are looking for a “souvenir” from the city that you’ll *actually* use, here is a map to the best vintage shops in Amsterdam. Throw away your old stereotypes about second hand. If you’ve ever thought that you don’t shop there for clothes because they’ll be outdated, clearly you haven’t visited VENTEN. If you’ve ever thought you couldn’t furnish a home with second-hand items because you don’t have time to browse through a disorganized mess, you need to check out one of the several Rataplan stores around the city. 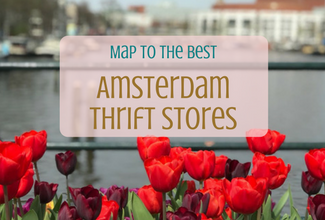 The map is a complete listing of all the thrift stores in Amsterdam. I have categorized them between type and my personal ranking. I’ve selected a “ranking” for each store between 1 and 5 (5 being my favorites) as an initial attempt to provide a general sense of the shop offerings. Of course, these rankings are based on my own personal preference so you may actually love a store that I’ve ranked a 2. However, in general, stores that have a more chic and organized feel to them and have a varied and revolving section will receive my higher ranking. You can them zoom in and out of the map depending on your location and the options available. Hovering over a location pin will give you the store name and category types. Clicking on a location pin will open up a light box with more information, including a link to the website and Google Maps directions. Additionally, below the map is a list of all the stores that will match your current filtered category selection. Click on a store name and you will find the website and Google Maps directions. I hope this map gives you good information on where to shop in Amsterdam Browsing through thrift stores in Amsterdam is super fun. Whether you’re looking for something specific, or you just want to see what unique items you can find, with 57 options in the city, you’re bound to find a new favorite item. Be good to the planet, do good for the community, and keep your bank account high – shop second-hand as your first choice. And let me know what gems you find!